In large bowl, mix olive oil, garlic, Italian seasoning, salt and red pepper flakes. Add squash, zucchini, bell pepper, tomatoes and onions; toss to combine. Divide evenly among sheets of foil. Place packs on grill over medium heat. Cover grill; cook 6 minutes. Rotate packs 1/2 turn; cook 5 to 7 minutes longer or until vegetables are tender. Remove packs from grill; cut large X across top of each pack. 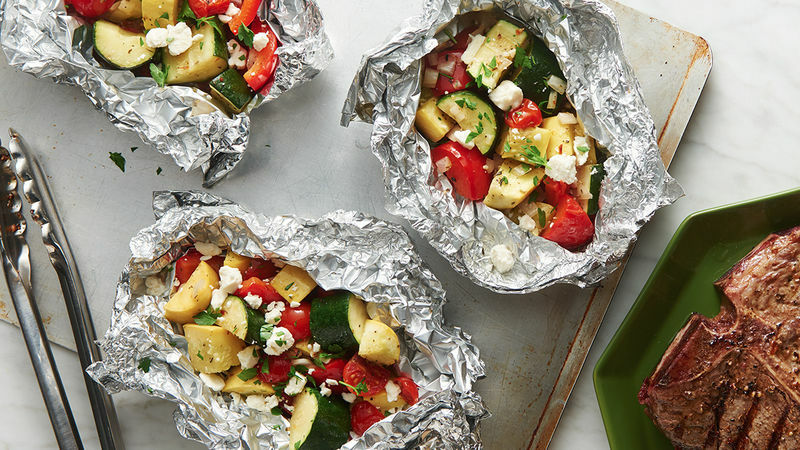 Carefully fold back foil, and garnish with feta cheese and parsley. To make in oven, place packs on cookie sheet. Bake at 375°F 18 to 22 minutes or until vegetables are tender. Carefully fold back foil, and garnish with feta cheese and parsley. Vegetables can be cut and tossed in oil mixture, then covered and refrigerated up to 2 hours before placing in foil packs and grilling. Can’t take the heat? Substitute ground black pepper for the red pepper flakes.